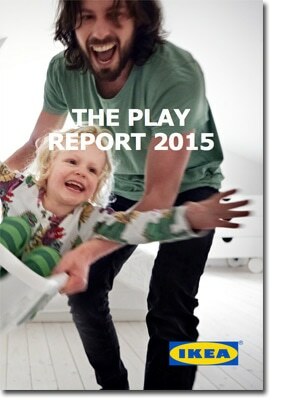 IKEA’s latest Play Report is thought to be the world’s largest research study on child development, parenting, family life and the importance of play. Family Kids & Youth designed and analysed the research together with the team from Children’s IKEA and follows the earlier report we carried out in 2010 in 24 countries. The 2015 report has involved interviewing over 16,000 parents, 6,000 7-12 year olds and nearly 7,000 13-18 year olds in 12 countries. Panel provider, Research Now, carried out the online fieldwork. The report provides insight into family life today and shows us that part of our job in creating a better everyday life at home should be to inspire and enable people to play more together. Two in five parents and young people would like to spend more time talking face to face as a family. A quarter (23%) of parents admit to sometimes only communicating with their immediate family while in the home through text message or social media. The majority (63%) of young people aged 13-18 rate their family as being more important to them than friends. Four-fifths (81%) of 7-12 year olds would prefer to play with friends than watch TV (19%). Three out of five (60%) parents think that ‘everyone should spend more time playing and less time working’. The full report, including results, charts and accompanying questions, can be downloaded here.